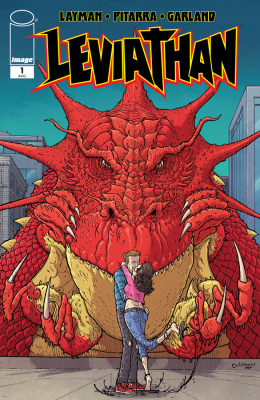 Reviews Leviathan #1: Party Monster! It all started as an average night of alcohol-fuelled partying, but when the beer ran out things got monstrous … Remember that time you were throwing a party and ran out of beer, and when you went to get more your bored friends summoned a monster from hell? I know for some of you this is another Saturday night. However, for Ryan Deluca, this is a first and his normal life is about to be turned upside down. If you’re looking for a tale of romance, monsters, and satire then stop looking down at the ground. Look up. Look way up. See that towering beast? That creature is your ticket for a mayhem-filled ride to the world of good old fashion kaiju entertainment. That creature is the Leviathan! John Layman (Chew) has once again brought us an inspired book laced with satire, slick humor, and imagination. Leviathan is funny, entertaining, and chock-full of building smashing, people stomping goodness. In a common genre such as this, it is rare to see a unique take with fresh setups and a plot that isn’t completely obvious. Layman’s story flows quick yet smoothly and offers up new aspects as well as many different possible plot threads. It’s hard to tell exactly where he’s going with it, but I’m sure it’ll be great. To prove this point, he also gives us an intriguing twist to ponder on til’ next issue. To back up the story, Layman has also given us a nice mix of loveable relatable characters and truly bizarre individuals that will be fun to watch grow and change as the story progresses. I am very excited as to where he’ll take things next. Plus the cover for issue two brings about more questions as well as absolute excitement. The art in this book is a beast all of its own. It is fantastic! Nick Pitarra (The Manhattan Projects) brings us a truly wicked looking creature that would strike fear in even the biggest, meanest, and most ferocious of the oversized moth population (I don’t care how big their mothballs are). This beast is a true showcase of Pitarra’s talent, especially in his full page spread on pages 6 & 7. He is very good at capturing the monstrous mayhem that fans of this genre have come to love. However, that’s not the only place where he excels. His characters all have such unique looks and features that set them apart and hint at there different personalities and traits. As an added bonus there are character sketches and layouts in the back which are super fun to look at, and give us an even better glimpse into Pitarra’s talent. 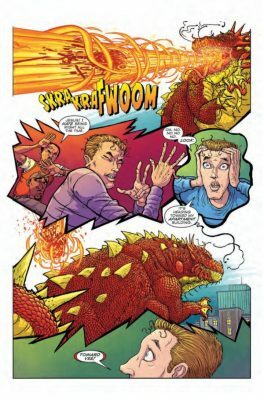 This book is a love letter to those of us that love kaiju movies and secretly long to be the king of monsters. For now, though, that title goes to the team of Layman and Pitarra. We should all expect BIG THINGS (see what I did there) from this comic, and I don’t think we’ll be let down. With great visuals and an exciting story, this book is a must-read for anyone with an appetite for destruction.